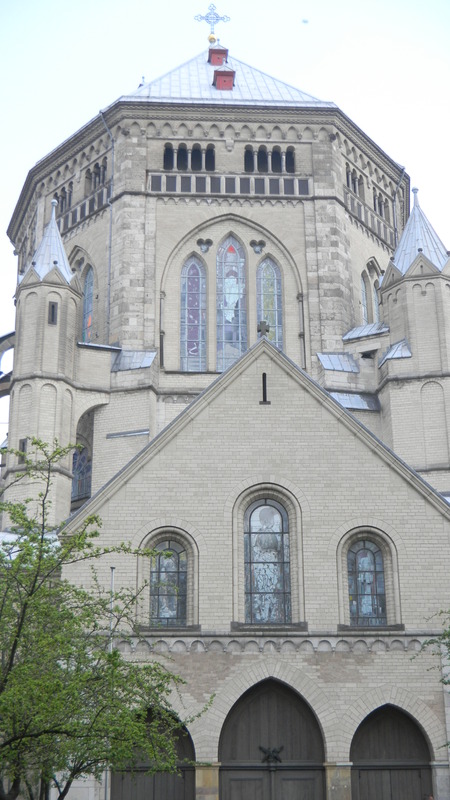 I didn’t know that so much splendor awaited as I approached the basilica of St. Gereon in Cologne, Germany. 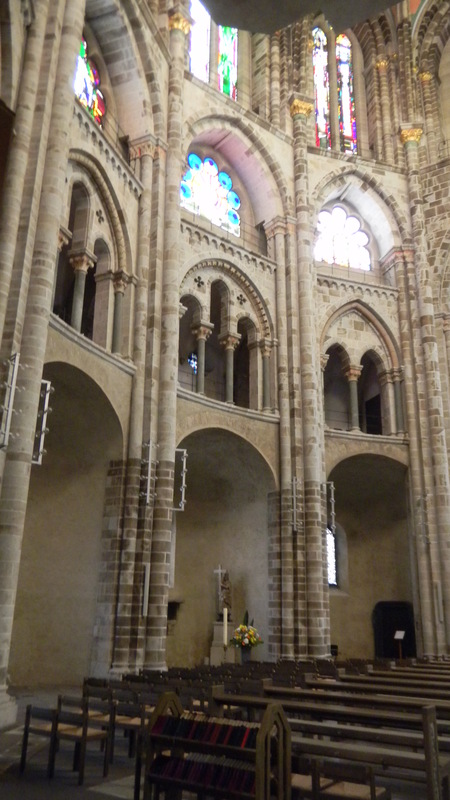 But Germany created many of the best examples of Romanesque architecture. She stuck with the forms while people north of Paris developed Gothic style, and she left us with many buildings to savor. St. Gereon is supposed to have been a Roman soldier from Egypt who bas beheaded in the 3rd century for refusing to sacrifice to pagan gods for victory in battle. Like the story of St. Ursula, which was also central in medieval Cologne, Gereon’s story grew bigger in the Middle Ages–people believed that he died with many martyrs. The beheading might have happened at the site that the first church was built on in the 4th century (it wasn’t a basilica until 1920). But though the merchants in medieval Cologne admired St. Gereon for his will to resist, the basilica’s nave fuses Christian and ancient Roman art so well that I found it spell-binding. The nave has 10 sides, and it soars to a magnificent vaulted ceiling, which was the largest dome built between Constantinople’s Hagia Sophia in the 6th century and Florence’s cathedral in the 15th century. Why this unusual shape? It was built on the walls that ancient Romans constructed. So this stately geometrical pattern from the ancient West shaped the medieval church. 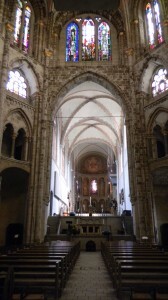 This nave has 2 levels. The first was begun in Roman times and added to in the late 11th century. 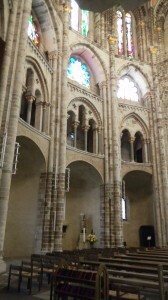 The upper contains the soaring Gothic windows, and its majestic vault was completed in 1227. 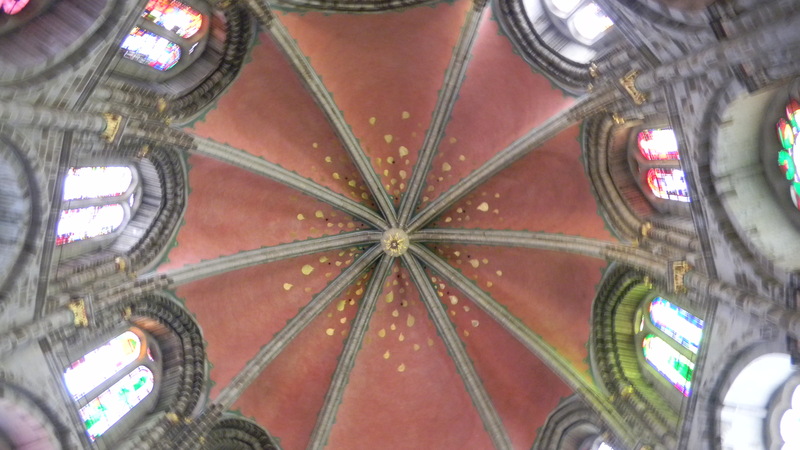 So the ancient architectural form shaped the nave’s soaring flight into the heavens. 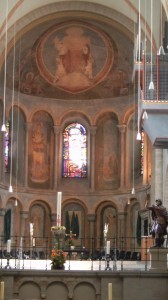 The above shot looks through the nave and towards the choir at the far end, which is in equally stately Romanesque forms. So the basilica reaches for the sky, but with static forms from ancient Greece (colonnades) and Rome (arches), which are arranged in lines. Gothic architecture also stressed linear arrangements of proportioned geometric forms. These recent posts have been doing an East-West thing. While China in the Song Dynasty unified its cultural landscape with Confucian classics and assumptions that nature is naturally holistic (and thus the classics’ teachings resonate throughout the world), the West stuck to its ancient preference for linear relationships. and permanent ratios as models of order. And India at the same time emphasized an abundance of forms that reflected its vast metaphysical landscape. The medieval cultures in each land unified themselves with ideas and art forms that were already established in their ancient pasts. They added ingeneous variations to their traditions and left us with so much cultural wealth to compare that we can fly into the heavens that they aspired for. You can admire more German Romanesque architecture at Speyer Cathedral, which ruled on the southern Rhine as Cologne presided on the northern Rhine. 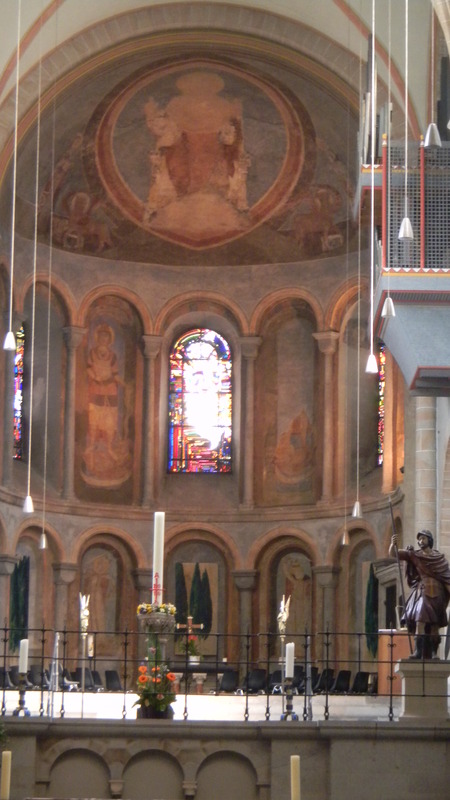 Next post: Great St. Martin, The Most Beautiful Romanesque Church In Germany?